To echo around an appliqué, the perimeter of the appliqué needs to be traced first. Select Add Block then either trace on quilt or mark on quilt. I often take a short cut here and select trace on quilt, lift the motors then set my machine to regulated stitching and manually stitch in the ditch around the appliqué as I trace. If you do this, remember to touch ‘start’ on iQ before stitching. It’s very frustrating to think you’re tracing only to glance up at the screen and see nothing. Don’t forget to touch stop at the end too. 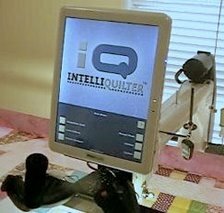 The outline of the appliqué is now entered as a block on iQ but it needs to be a pattern in order to create echoes. On the Add/Edit block page, select Block to Pattern. If you need to keep the original block to use as a no-sew zone or clipping block later, copy the block and move the copy to one side before you change it into a pattern. On a quilt with many appliqués that all look the same, such as Sunbonnet Sue, it will be necessary to trace the outline of each appliqué because no two will be the same. It won’t be possible to copy the first echoes created and use them for every appliqué. Although this does take a little time to set up, the results will be well worth the effort.